Brent Wellman, shown centre, is the 2017 recipient. Congratulations to Brent Wellman, Director, Edwards Career Services on receiving the 2017 Safety Recognition Award. 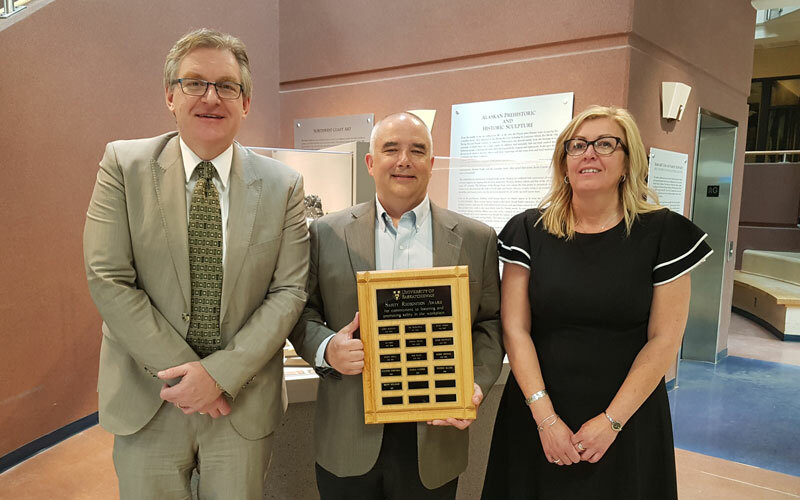 This award recognizes the outstanding performance of a University of Saskatchewan employee who fosters and promotes health, safety, and environmental issues in the workplace. As Chief Building Warden, Brent has championed a culture of safety in Edwards School of Business, and continues to go above and beyond for students, staff, and faculty. He is known as the ‘go-to’ guy for safety concerns in Edwards and works closely with Safety Resources to resolve issues and implement solutions. Brent is just one of the many individuals on campus who works hard to ensure that the U of S is a safe place to work. Thank you to everyone who supports Mission Zero.